Mount Eden is a suburb in Auckland, New Zealand whose name honours George Eden, 1st Earl of Auckland. It is 4 kilometres (2.5 mi) south of the Central Business District (CBD). Mt Eden Road winds its way around the side of Mount Eden Domain and continues to weave back and forth as it descends into the valley; it runs south from Eden Terrace to Three Kings. Mt Eden village centre is located roughly between Valley Road and Grange Road. The domain is accessible on foot from many of the surrounding streets, and by vehicle from Mt Eden Road. 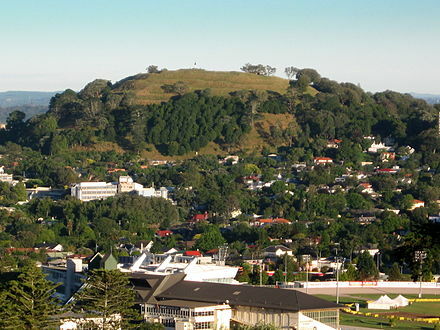 The central focus of the suburb is Maungawhau / Mount Eden, a dormant volcano whose summit is the highest natural point on the Auckland isthmus. he area directly around the hill consists of very fertile free-draining soil mixed with a great deal of volcanic debris in the form of scoria rocks. When Europeans came to the area, they found a landscape devoid of large trees, as anything of any size had been cut down by the Maori for various uses, such as the timber palisades of the pa. The land was covered with bracken, flax and Manuka trees, with whau shrubs growing on the hill. The Europeans cleared the land of the scoria rocks and made fences with them to define property boundaries. This resulted in a landscape reminiscent of Ireland or the Scottish lowlands. These scoria walls are still a feature of the suburb today. Initially the land was utilised for farms, but from quite early on the area hosted country residences of professionals and business people from Auckland. Most of the farm land was subdivided into large suburban plots between 1870 and 1875, and the principal roads were formed by the Crown. Mt Eden’s first school opened in 1877 on the corner of Mt Eden and Valley roads. In 1879 the mountain was officially protected as a public reserve. The tea kiosk on the slope of Mt Eden was built in 1927. Mt Eden is now a “leafy suburb” predominantly of large houses from the first half of the 20th century. The gardens are verdant and the trees have grown large. On the eastern slopes of Mt Eden were constructed several large country houses set in extensive grounds. These included “Harewood House” (now the site of the Mater Hospital), Justice Gillies “Rocklands Hall” (now a hostel), Alfred Buckland’s “Highwic” (now a museum), the Hellaby family’s “Florence Court”, Josiah Clifton Firth’s “Clifton House” (both still private residences) and Professor Sir Algernon Thomas’ “Trewithiel” (the garden is partially preserved in Withiel Thomas Reserve and the reduced house at 114 Mountain Road). Close by the current Government House (official Auckland residence of the Governor General) is Eden Garden, a ornamental public garden set up in a disused quarry. In the 1950s and 1960s the inner suburbs became unfashionable and the old houses of the Mt Eden area were comparatively cheap to buy. Mt Eden developed a slightly bohemian image during this time as a community of artists, writers, teachers and university lecturers made it their home. Mt Eden village is still regarded by many as the “Home Of Arts” in Auckland, due to the large amount of creative activity in and around the suburb and the large number of artists who live nearby.